A Church of England vicar has been arrested as part of an investigation into bogus marriages. Reverend Canon Dr John Magumba was arrested at his home in Rochdale, Greater Manchester, as part of the UK Border Agency (UKBA) inquiry. 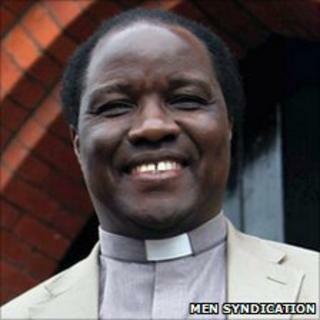 The 58-year-old, originally from Uganda, is team vicar for three churches in south Rochdale. Dr Magumba was taken into custody and released after questioning. He is currently suspended from duty. The investigation centres on ceremonies at St Peter's in Newbold, St Luke's in Deeplish and St Mary's, Balderstone. UKBA officers arrived at Dr Magumba's home on Thursday and arrested him on suspicion of the facilitation of immigration offences. The agency has carried out dozens of investigations into sham marriages in the north west of England but it is the first time a vicar has been arrested in the region. A spokesman said: "The UK Border Agency arrested a 58-year-old man in Rochdale on Thursday morning for questioning in connection with an ongoing investigation into sham marriages in the North West. "He has been released on bail." A church spokesman said: "The Reverend John Magumba was questioned by the immigration crime team over irregularities in relation to weddings. "He will continue to help the authorities with their enquiries over the coming weeks. "Following proper procedures, the Bishop has suspended his licence to operate as a minister of religion while the investigations continue." Sham marriages usually involve a non-European marrying an EU citizen to secure long-term residency, the right to work and the right to claim benefits in the UK.